Clark is getting more and more interested in holidays. We decided to make something for his grandmas for Valentines day, and hot pads seemed like the perfect choice. I was able to use up left over fabric from our Christmas stockings, and put some ric-rac trim to good use. Do you want to make one? I'll show you how. 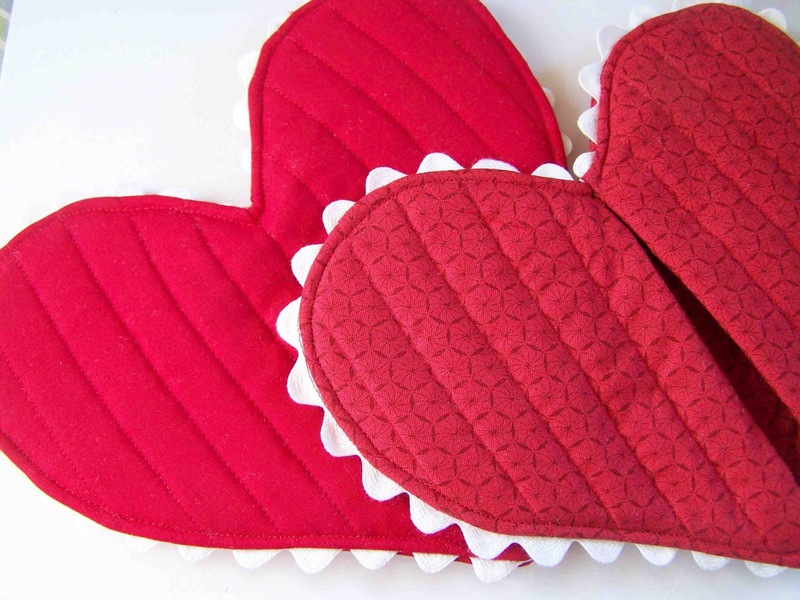 note: my heart hot pads are a bit on the small side, they are great for older kids, and average sized women's hands, but if you are making this for larger (man) hands, then you may want to enlarge the template when printing. You can do this by adjusting the scale on your print settings. Cut two pieces of insul bright on fold. Take one of your insul bright hearts, and cut it down the middle. 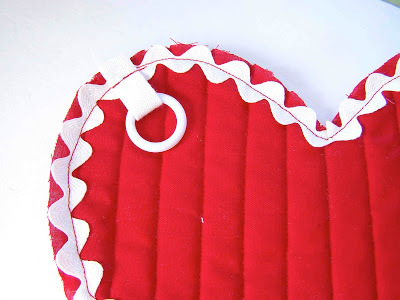 Now take one half heart and place it on the wrong side of one of your fabric hearts. Fold the fabric over the insul-bright. 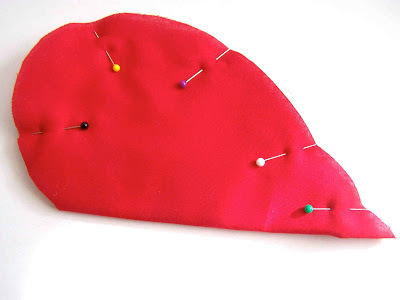 Pin the fabric in place. Repeat with remaining half heart. 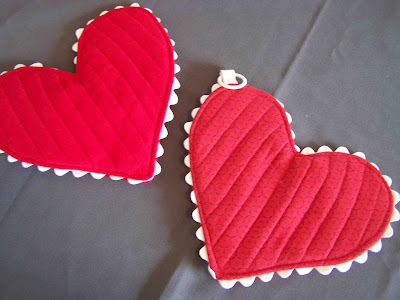 Take your two remaining fabric hearts, and sandwich your insul-bright heart between them. Right sides should face out. Pin in place. Now we are going to quilt the heart pieces. I started with the half hearts, and started on the folded edge, sewed lines 3/4" apart. 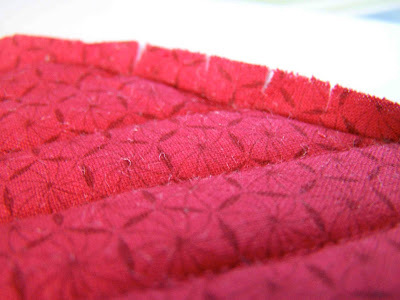 If you are a little nervous about your fabric shifting as you quilt, you may want to stay stitch around your pot holder pieces 1/4" away from the raw edges. This keep your pieces secure while quilting, but it make cause some puckers to form. I skipped this step. If your sewing machine comes with a quilter's guide attachment, it can be really helpful. I quilted the pieces 3/4" between lines. If you have a quilters guide then you will want to adjust it to 3/4" from your needle position, and line it up with your previous stitching line. 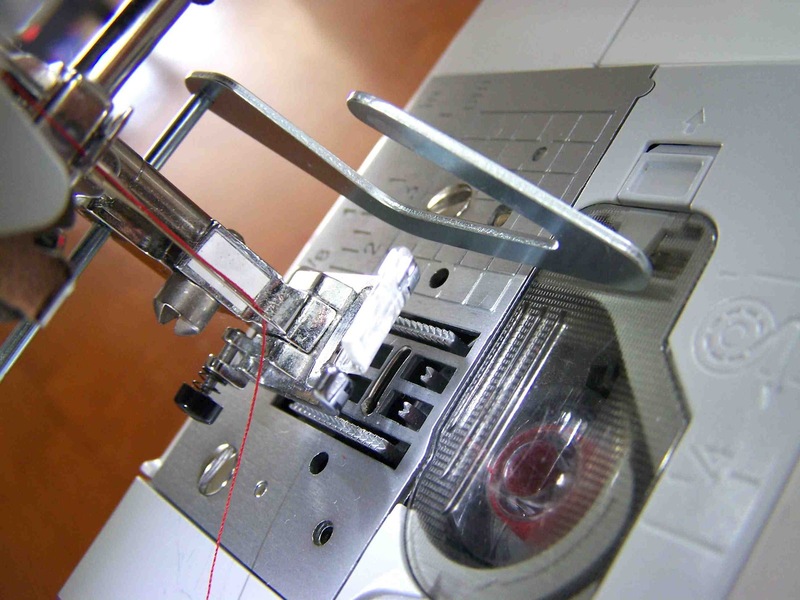 It will ensure that your stitching lines are relatively straight. If you don't have one available, it really isn't a problem. You can quilt it however you'd like: straight, crooked, zig zag, heart shaped. Quilt both half hearts, and the full heart. When I quilted the full heart I sewed down the center of the heart first, and then worked my way out. 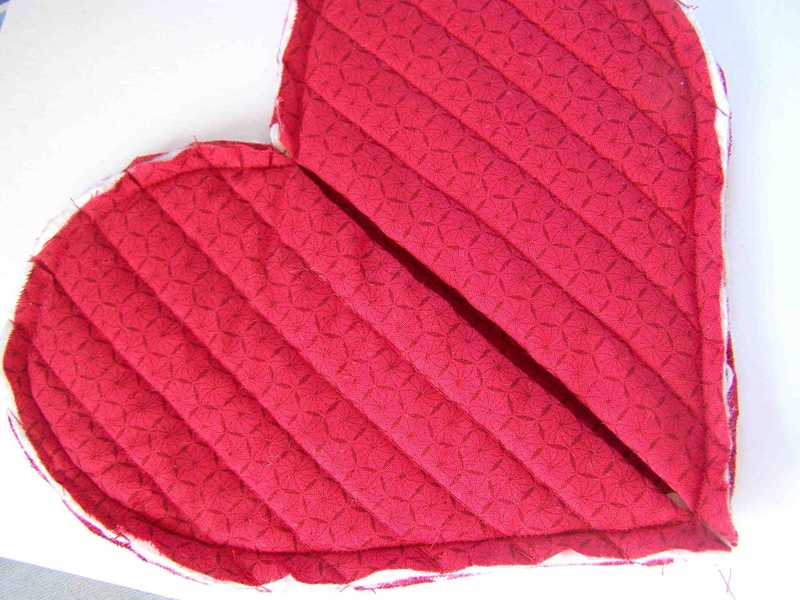 After I finished quilting one side of the heart I turned the heart around, and quilted the other half. Now we are going to attach the ric-rac. To do so you will start at the bottom of the heart, and the outside of the ric-rac with the raw edges of the heart. 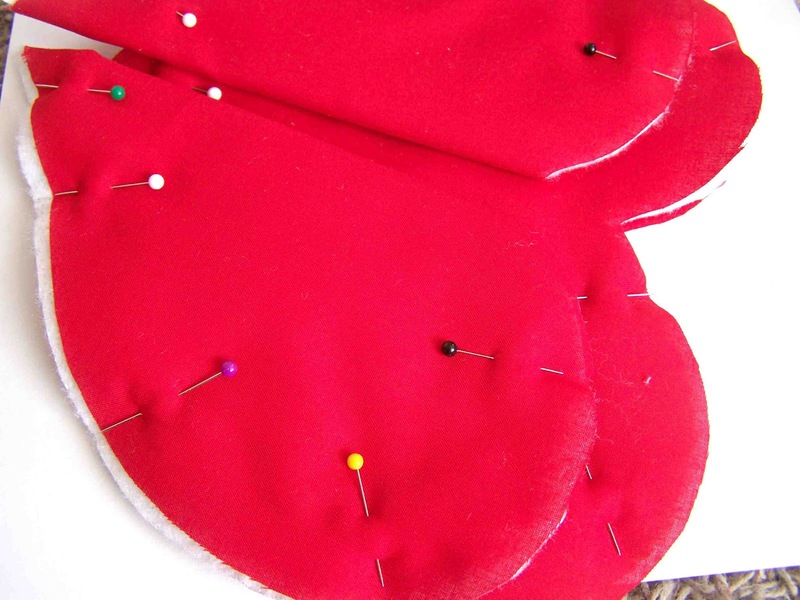 Stitch down the center of the ric-rac, and follow the contour of the heart. With my trim aligned this way, the center of the ric-rac was approximately 3/8" from the raw edge of the heart. 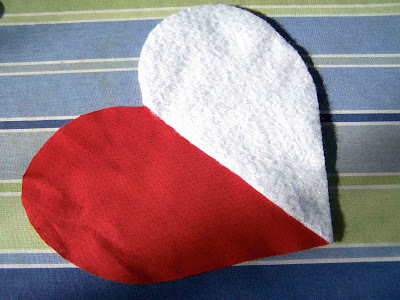 The top valley of the heart can be a bit tricky, but I simply folded the ric-rac over itself when I came to the point. It's a really small fold. You may luck out and not have to do this at all. Next take your plastic ring, and place it in the center of your twill tape. 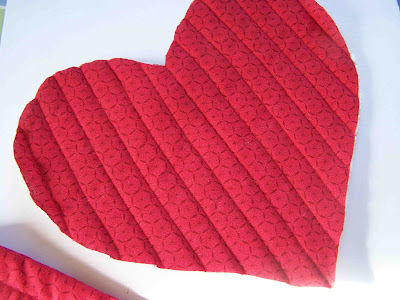 Fold the twill tape in half, and align the raw edges of the tape with the raw edges of the heart. Stitch the twill tape down 3/8" from raw edge. Next take one half heart, and place it on top of the full heart. The ric-rac side of the full heart should be sandwiched in the middle. Pin in place. Repeat with second half heart. Stitch the half hearts in place. 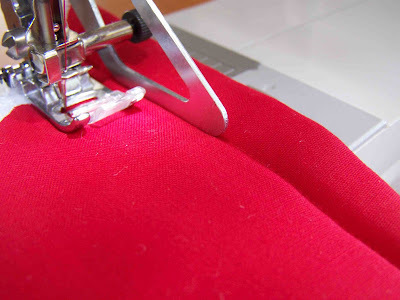 Use a 1/2" seam allowance to ensure that your ric-rac attachment stitching is included in the seam allowance. Clip the edges of the hot pad, taking care not to clip through stitching lines. Turn the hot pad right side out. The clipped edges will be on the inside. 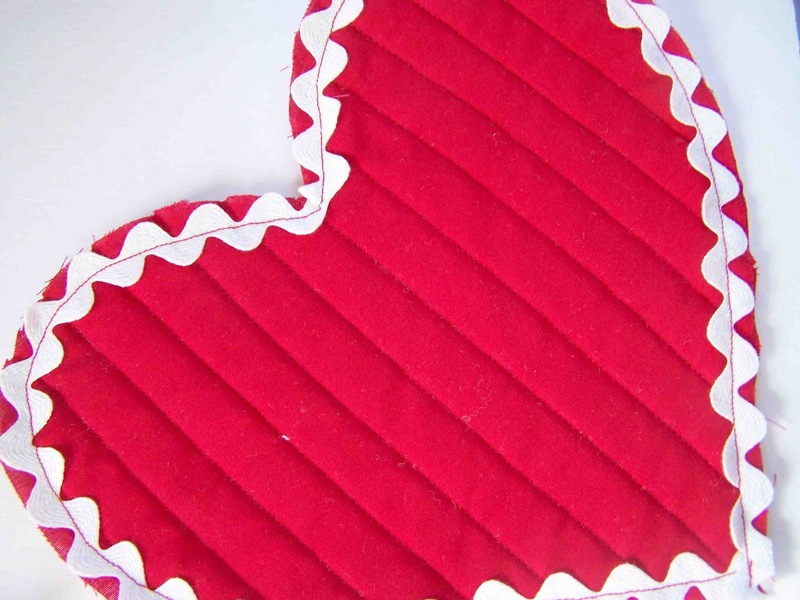 Topstitch around the edges of the heart. This will help your hot pad keep it's shape during laundering, and it gives it a more finished look. That's it. 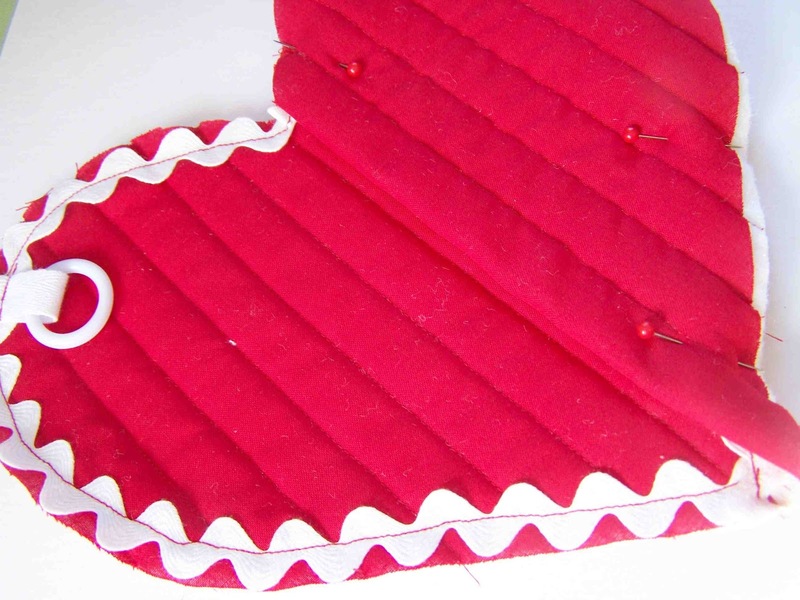 Whole Lotta Heart Hot Pads, ready for gifting. This is very cute. I'm going to make some. :) Thank you so much for the tutorial. Love these - your tutorial is great! Thanks for posting - I've pinned this, by the way. These were so cute, I shared them with my readers. They will love your post. These are the cutest! I'm pinning them! 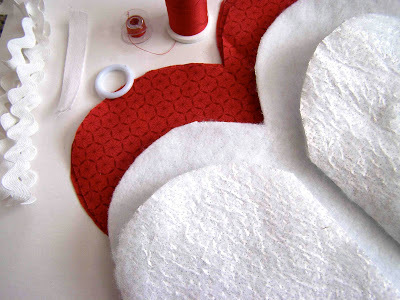 Great tutorial for darling hot pads! Thank you! 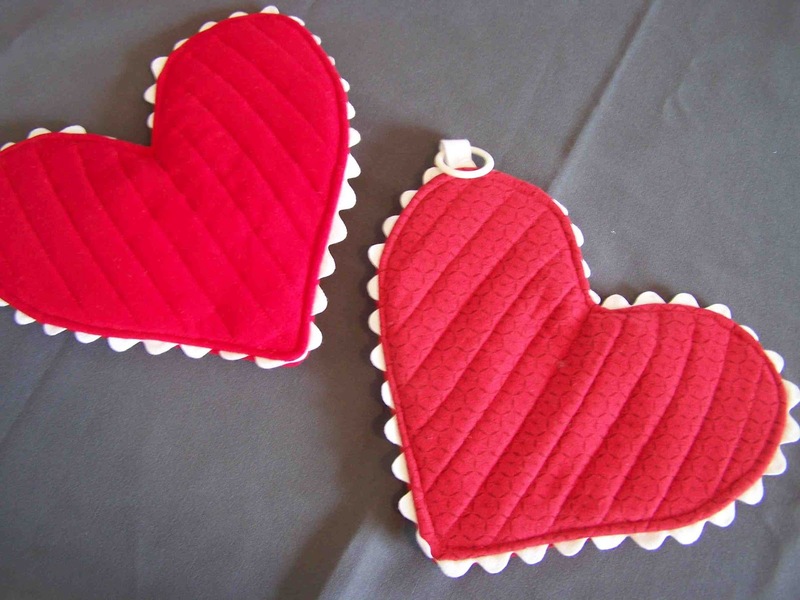 Thank you SO much for your great, pretty potholders - that would be a GREAT gift to anyone! I appreciate your time in sharing, and for free! Thank you very much for the tutorial, I made some as presents (and for myself). 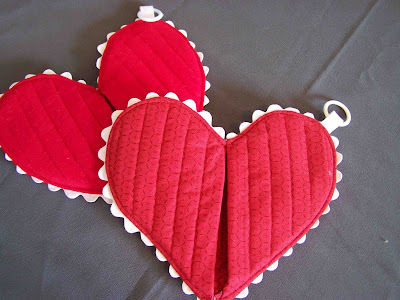 Cute potholders! Thank you for this tutorial!